by newsweek.com --A powerful Libyan general in charge of much of the country has set out to claim the capital, potentially overthrowing a United Nations-backed government and allied militias. Field Marshal Khalifa Haftar, the commander of the self-proclaimed Libyan National Army, ordered his troops on Thursday via an audio message to begin a new bid to take Tripoli just as U.N. General Secretary António Guterres paid a visit to the disputed city. The military leader said "the time has come" for his forces to "advance," but would do so in "peace" as he'd ordered his forces to not "shoot civilians waving a white flag." As Haftar's men took the town of Gharyan, located about 31 miles south of Tripoli, a joint statement by France, Italy, the United Arab Emirates, the United Kingdom and the United States warned that "military posturing and threats of unilateral action only risk propelling Libya back toward chaos." The country has been beset by frequent bouts of civil unrest since the U.S.-led NATO Western military alliance helped to overthrow Muammar el-Qaddafi in 2011 by backing an insurgency against his 42-year rule. By Friday, the Libyan National Army had entered the capital's outskirts, taking the nearby town of Al-Aziziyah. Spokesperson Ahmed al-Mismari announced that Tripoli's international airport was "fully under the control" of the faction as part of an operation now officially named Flood of Dignity During a press conference Friday, Mismari outlined the operation, displaying graphics and a cross-country push from nearly 620 miles away, including positions such as the Al-Jufra desert air base. He vowed that the Libyan National Army "has not stopped and will not stop until the completion of the task." Awaiting Haftar in Tripoli was his rival Fayez al-Sarraj, the U.N.-backed chairman of the Presidential Council and prime minister of the Government of National Accord. 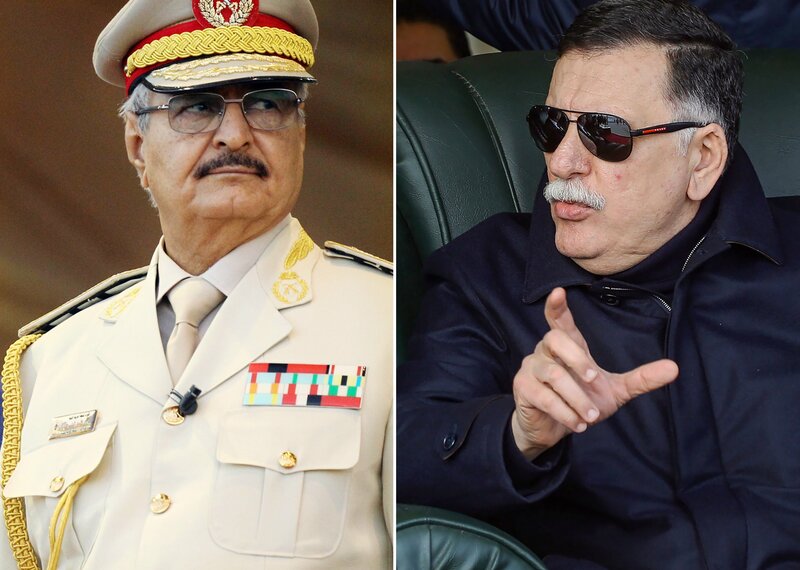 Both men previously worked for Qaddafi's government—Sarraj as a housing minister and Haftar as a leading military officer who ultimately turned on the longtime leader with support from the U.S., where he later fled and gained citizenship. Since Qaddafi's ousting and subsequent execution at the hands of rebels in 2011, the two leaders have emerged as the most influential in the country. Haftar's military prowess, however, has allowed him an advantage in leading the fight against the Islamic State militant group (ISIS) and various other factions seeking to gain a foothold in the country's future. At the same time, he has been accused of committing extrajudicial killings in his lightning campaigns against foes. Haftar, now in charge of the vast majority of Libya's territory in the name of Bayda-based Prime Minister Abdullah al-Thani and the Tobruk-based House of Representatives that has endorsed him, has also sought Russian assistance. As the Libyan National Army told Newsweek in August, this was limited to getting Moscow to push the U.N. to lift sanctions that suspended Qaddafi-era military agreements, supporting a French agreement to have elections in Libya and checking former colonial power Italy's intervention in the country. While Hafar has held private meetings with Russian officials in past years, Moscow did not endorse his most recent offensive. "We believe that all Libyan parties involved should remain calm and show restraint," the Russian Foreign Ministry said Friday in a statement. "It is obvious that the military scenario could bring down the already extremely difficult situation in the country, and this will result in new victims and destruction. Such a development will postpone the prospect of establishing a stable inter-Libyan inclusive political process under the aegis of the U.N. with the ultimate goal of establishing uniform effective state institutions through general elections." Backing Sarraj on the ground was a merger of pro-unity government militias established late last year and known as the Tripoli Protection Force. These militias include the Tripoli Revolutionaries Battalion, the Abu Salim Central Security Forces, the Nawasi Battalion and the Interior Ministry's Special Deterrence Forces. Some of these forces have been accused of kidnapping and various other criminal acts as competition for influence fueled lawlessness in the capital.